This bookcase belongs to our awesome neighbors who were *sniffle* moving away.. but just back in to Austin. 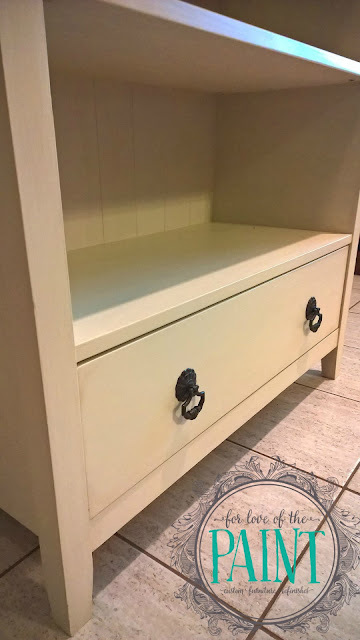 It was originally a light pine color, and they wanted a more vintage feel to it. They had their hearts set on Annie Sloan Chalk Paint in Old Ochre, with an accent of Duck Egg. We decided against distressing since the pine was so light, but instead I put a touch of Dark Wax over the sealant on the edges and in the corners to add just a bit of dimensionality and age to the piece. 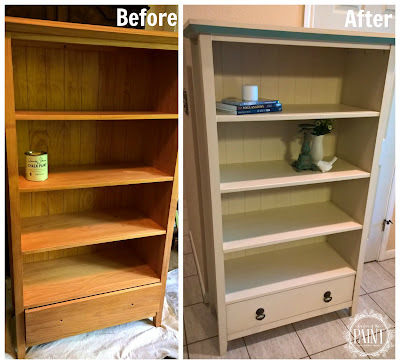 There is a LOT of square footage, nooks, and crannies in this sort of bookcase, and due to the high wear surfaces I opted for Pure Earth Paint's Diamond Coat (now called Rock Hard) to seal. The updated antique hardware is exquisite, and was gifted to me from one of my fantastic clients! It brings a gorgeous stately vintage/antique feel to this previously modern-look bookcase. Thanks for everything, guys!! I hope this bookcase is a perfect accent piece in your new home!! Another photo with a closer view of that gorgeous hardware and the dark wax detailing after the break!